If you walk away with only one thought, it needs to be this – the total addressable market (aka TAM) for servers took a massive leap up. TAM went from $18.5 billion to $22.5 billion. That is a rising tide that will raise all server-related ships, be it AMD (AMD), Nvidia (NVDA), or Intel (INTC) providing the hardware. To travel down memory lane, AMD was a much different company before Ryzen was released. The company was struggling to stay alive and selling off various parts. Ryzen changed everything. Let that sink in. Ryzen put AMD back on the road map and gave the company a pulse again. AMD’s server chip EPYC is the spark for AMD. EPYC is starting to ramp. The server followup chip Rome is going to be the fire. 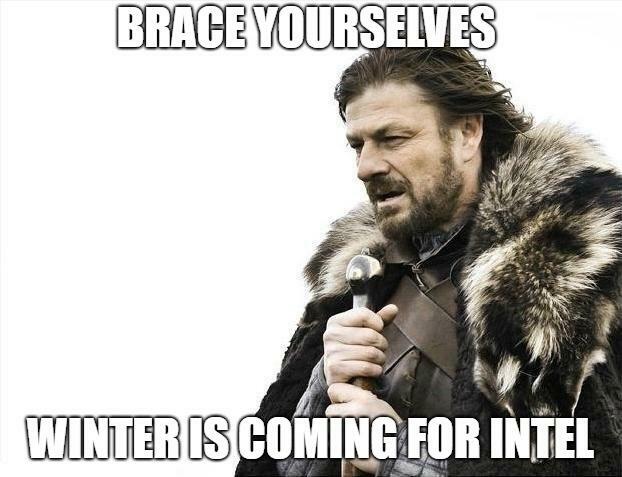 Winter is coming for Intel. 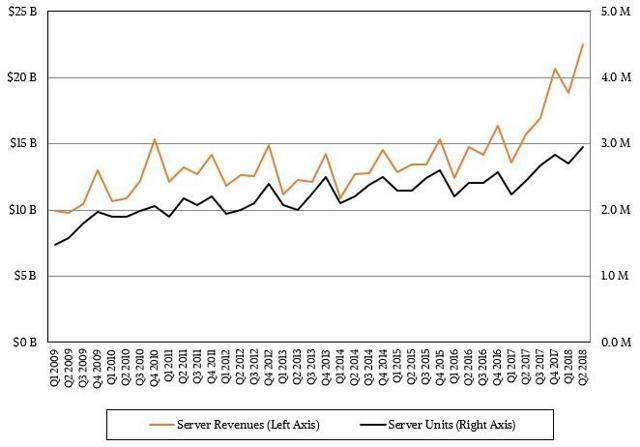 AMD is going to take its chunk of the server market with time. 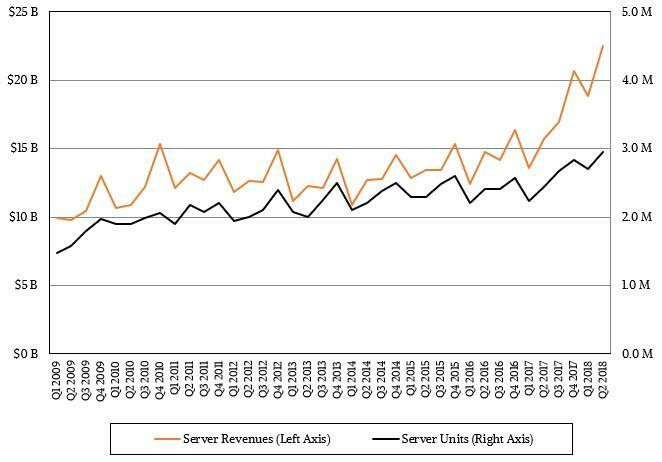 “Volume server revenue increased by 42.7% to $18.4 billion, while midrange server revenue grew 63.0% to $2.5 billion. High-end systems grew 30.4% to $1.7 billion.” That is quite the TAM for AMD to attack. Assuming AMD takes 4.5% to 5.5% of that market by Q4 with ramping going to 10%-plus by the following Q3… you get the picture. This bodes well for AMD since EPYC gives performance at reduced component costs for AMD partners, while providing AMD with very high gross margins. As EPYC ramps, we can expect to see a corresponding rise in margins. Current rumors paint a picture of demand exceeding supply for Intel chips. Per DRAMeXchange: “TrendForce has adjusted its 2018 global notebook shipments projection downwards due to the worsening shortage of Intel CPUs” and “TrendForce now estimates that this year’s total notebook shipments will drop by 0.2% YoY, and the CPU shortage may further impact the entire memory market as well.” That’s an interesting projection, but if I were a laptop maker such as Dell you can bet I would be considering an alternative CPU supplier such as AMD to replace those chips that Intel is unable to supply. Semiaccurate recently published a story that HPE was telling customers to buy AMD EPYC chips since Intel Xeon was MIA due to demand. Why so much demand for Intel? Well, no one ever got fired for buying Intel. AMD is the underdog, but “every dog has its day” and that day gets closer when HPE is recommending clients buy AMDs’ EPYC. Short term, Intel will benefit from the demand but its part of the server pie will shrink given time. To wrap, the TAM is growing fast and the rising tide bodes well for AMD. AMD has run very fast and we personally consider the stock dangerous, but it’s also dangerous to be on the sidelines missing a spectacular run. Thus, we are using options to place less capital on the firing line. However, the capital we use has far more risk associated with it. If AMD were to pull back, the options would suffer. Given the time decay things could get rather nasty. The takeaway is that if you want to gamble, gamble smart. While cautious of any fast rise, we do need skin in the game. Currently, we are sitting on our January 2019 $30 calls, February $30 calls, April $30 / $31 calls. We have opened February $35 calls as a very speculative position (in case the run continues). Do note: These are dangerous positions (due to the nature of options), but in our opinion we prefer this to buying large swaths of common stock. These options should be viewed as simply ideas to explore. Due to the fast nature of options, they should not be viewed as something to mimic (as the data will be stale for the reader). If you require more help, please consult your broker. In case you missed it – here’s the interview w/ Dr. Lisa Su. Disclosure: I am/we are long AMD, NVDA.